How I have grown since last we spoke, at a time when I was just about to embark on my journey into the uncharted (sort-of) territory of the Mainline Theatre, host of Bouge d’Ici dance festival. It all began at Projet Migration. Slater Penney, dancer and “physical comedian,” was trying to marry members of the audience in order to set the cheeky, playful tone of the 45-or-so minute show. Projet Migration is the pairing of Christine Germain’s choreography and Penney’s collaboration to tell the tale of bureaucracy and marriage, of systematized immigration laws and of the toll it can take on a bond between two people. 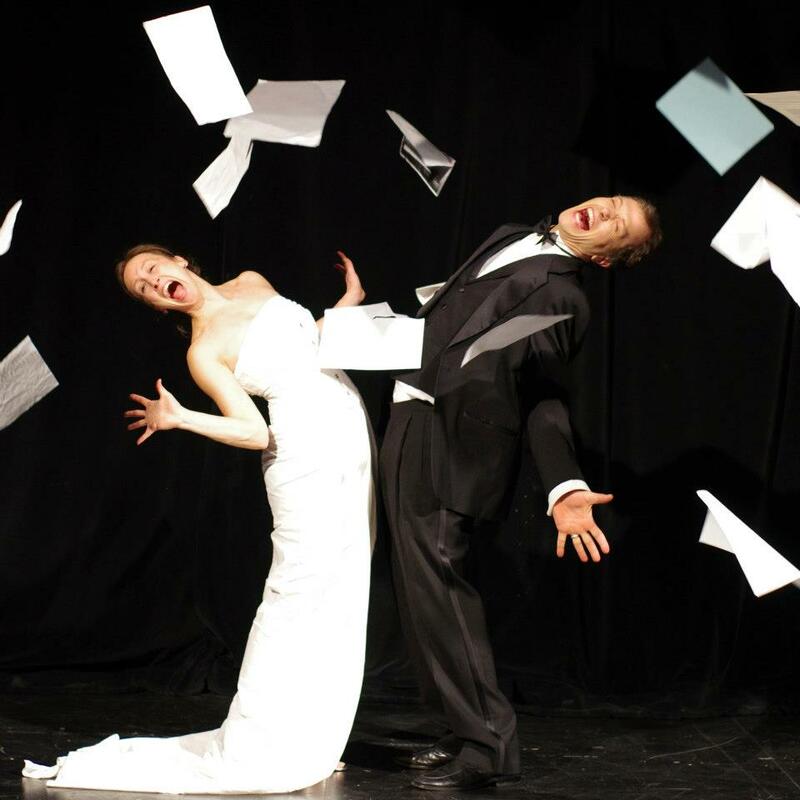 The show is a clever use of minimalism; two dancers, a pile of paper, and a bed-sheet with multiple uses fulfill most of the show’s functions. Machine-like bureaucratic voiceovers, twitchy music written by Frédéric Péloquin, and stressful lighting arrangements give the dancers all they need to express the uncomfortable situation they’ve found themselves in, forced to marry just when the honeymoon phase was getting good. Echoing the feelings of the dancers, we experience at once the euphoria of love and the tension of commitment, the vulnerability of strangers and the struggle to maintain one’s individuality under the pressures to assimilate into a married unit. What Projet Migration does best is to reenact, with few words, the emotional process of a real-life scenario. It is a touching piece with moments that we truly recognize as profoundly real. No wonder Projet Migration was the winner of the “Most Promising Choreographer” award at the 2012 Montreal Fringe Festival. Somehow, it manages to communicate a sincere vision with choreography that is at once real and surreal. Bouge d’Ici showed it’s multifaceted spirit at CinéDanse, an evening of dance films expertly curated by Paul Aflalo, Amy Blackmore and Holly Greco. This popular event celebrated its 4th birthday and, proving its growing success, the curators were forced to select 12 submissions out of a not-so-modest total of 55. The selected films showed great range — from creatively amateur to higher budgeted professional pieces, a careful combination of choreography, sound, music and editing tied all of the works together. But each individual piece worked well to create its own environment, its own feeling. A darker, more dramatic piece showcased naked, grimy dancers crawling out of dark caves. More light-hearted and playful pieces ranged from an argument between the controlling mind and the body that longs to be silly, to stop-motion playmobile choreography. One film incorporated both in what at first seemed to be a depiction of mental crises, but then ended up being a ploy to trick strangers into dancing. People of Montreal, a great opportunity lies ahead of us this week! This festival is not over yet. And judging by my experiences thus far, I feel confident enough to encourage your participation before it’s too late and you miss out and you are sad. January 17th, 10pm – So You Think That Was Dance? Event tickets for shows and workshops are between pwyc and $12 and can be reserved at 514-849-3378, or at the MainLine Theatre (3997 St-Laurent).